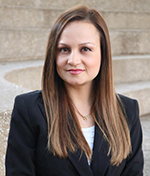 Our Dallas and Plano, TX, podiatrist Dr. Irene Arroyo was raised in Irving, Texas, and received her Bachelors of Science degree from the University of Texas at Austin. Her interest in podiatric medicine was influenced by an active lifestyle and her appreciation of the podiatric profession’s scope of practice. Dr. Arroyo earned her doctorate in podiatric medicine and surgery from Scholl College of Podiatric Medicine at Rosalind Franklin University of Medicine and Science in 2013. Her 3-year residency program in reconstructive foot and ankle surgery was completed at Advocate Illinois Masonic Medical Center/SCPM in Chicago, IL. During the final year of her residency, Dr. Arroyo served as co-chief resident. As a Dallas and Plano, TX, podiatrist, Dr. Arroyo’s clinical interests focus on foot and ankle pathology, elective surgery, trauma, and limb salvage. Dr. Arroyo is also fluent in both English and Spanish. The Dallas Podiatry Works mission parallels Dr. Arroyo’s, who takes pride in providing quality care to patients by practicing evidence-based medicine, using innovative techniques, and focusing on prevention methods to any person seeking podiatric treatment. Dr. Arroyo is married and lives in Dallas, TX. She is a sports fan, and she enjoys running, dancing, serving the community, and spending time with family and friends.